Your little guy will be the talk of the event when he arrives wearing this adorable multi colored bow tie set! 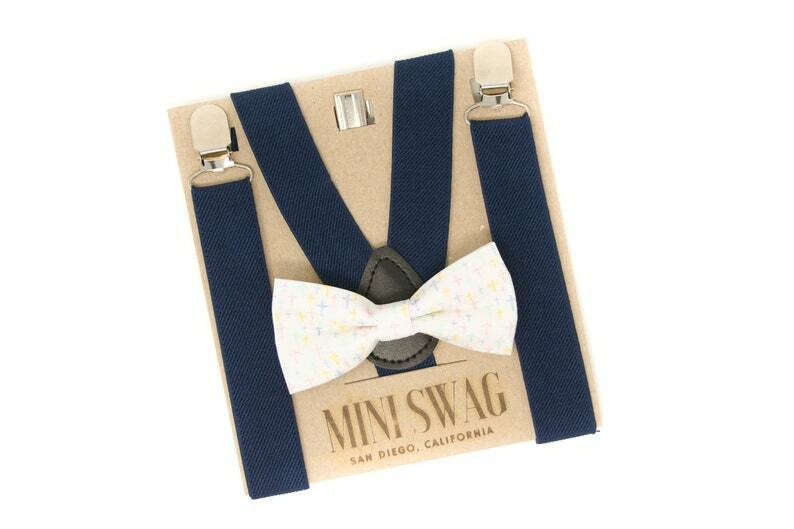 These navy blue suspenders and coordinating boys bow tie are perfect for a baptisms, Christenings, first communions, confirmations, Easter, Christmas, or any other special occasion. This set also makes the perfect gift! This 100% cotton bow tie features Christian crosses in shades of blue, yellow, and pink on a white background. It is double layered and reinforced with interfacing so it will hold its form well. The bow ties come in 2 attachment options- on an alligator clip (best for squirmy little guys) or an adjustable elastic neckband (best for older kids). See images. Adult bow ties come on an adjustable fabric neckband. Shipped on time and looked great on my 4 m/o God son!